If you fancy staying overnight the camping field is open why not come along and have your very own barbecue. Special displays this year, - 'A Farming Ancestry',- 'The Women's Land Army' and its role in both world wars, and 'Our Food' - what we eat and where it comes from. Well we are looking forward to the hottest weekend of the year so far! The farm shop is open for business and we've got lots of great products on offer especially if you're thinking of having a barbecue. All our usual pork joints, sausages, bacon, burgers and of course some great Dexter beef. Why not come up, sit in the tea garden and have a 'Giant Breakfast Bap' with bottomless cups of tea or coffee, lunchtime roll or afternoon tea with lovely cakes from Waring's bakery, while you are here you can have a look round our gift and second-hand shop in the barn, loads of new gifts and interesting second hand bits and pieces. You can walk up through the wonderful network of footpaths or drive up and park in the yard. Well lets hope the sunshine is here at last and Wysipig at Ellis's Hill Farm, Sindlesham Road. Arborfield and is looking forward to it’s monthly open day this Saturday May 10th. This month customers can learn about what Arborfield’s oldest farm shop has to offer for those planning a party this summer, from barbecues to hog roasts. 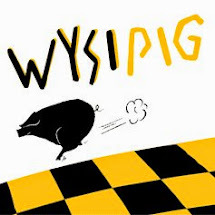 For more information please look at our website www.wysipig.net, follow us on Facebook or Twitter or call (07774) 989362 . Well it's a beautiful day, lots of people camping, why not join us for breakfast baps or if you are having a lazy monday come up this afternoon for tea.